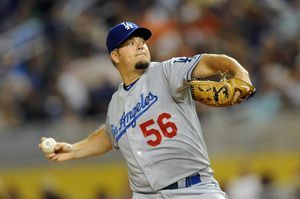 The Angels agreed to terms with righty Joe Blanton on a two-year, $15MM deal, tweets Jon Heyman of CBS Sports. The deal includes a third-year option, according to ESPN.com's Jerry Crasnick (on Twitter). Blanton is represented by CAA Sports. Blanton, 31, posted a 4.71 ERA, 7.8 K/9, 1.6 BB/9, 1.37 HR/9, and 44.6% groundball rate in 191 innings for the Phillies and Dodgers this year. The signing raises the question as to whether the Angels' rotation is set, with Jered Weaver, C.J. Wilson, Tommy Hanson, Blanton, and Garrett Richards, and without Zack Greinke. As Ken Rosenthal of FOX Sports tweeted earlier today, the Angels could be considering signing two starters for less than what it would have cost to make a competitive bid for Greinke. Earlier today, the Angels fortified their bullpen by adding lefty Sean Burnett on a two-year, $8MM deal. Blanton hadn't been the subject of a ton of rumors so far in the offseason, but the Twins were another team known to have interest, and were said to be eyeing the right-hander as a "prime target" in Nashville. Joe McDonnell of FOX Sports and Mike DiGiovanna of the L.A. Times first reported a deal was close. Photo courtesy of U.S. Presswire.